Kiddie Boost™ is our unique product formulated with children in mind. It combines the health benefits of non-acidic vitamin C, L-Glutathione, N-Acetyl Cysteine, and lactobacillus sporogenes into one great product. 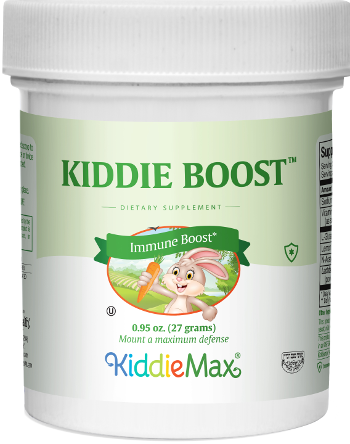 Kiddie Boost™ contains a buffered non-acidic form of vitamin C with mineral ascorbates. Its great for children with sensitive stomachs. Glutathione is an important antioxidant, and amino acid, antioxidants defend cells from free radicals. N-Acetyl Cysteine (NAC) is an amino acid, which helps the body form glutathione. Lactobacillus sporogenes are a probiotic that helps support a balanced intestinal environment and growth of the friendly bacteria in the digestive tract. It needs no special handling, survives stomach acid and produces lactic acid in the intestines. It is perfect for lactic acid sensitive individuals. Add one (1) rounded scoop to water, juice or applesauce, once or twice daily before meals, or as directed. This product contains no animal products, wheat, yeast, soy, gluten, salt, sugar, milk, artificial flavors, colorings or preservatives. My daughter was suffering from strep throats badly. We started Maxi Kiddie Boost daily together with Liquid Kyolic. She was amazingly healed. I had a bad cold. I took Kiddie Max Vitamin C with Zinc and Pantothenic Acid and I felt better. My brother was constantly sick. He had ear infections, strep, cellulites, herpes, and mono. Since my mother started giving him Kiddie Boost and B12 Lozenges, he feels perfectly fine. Thank You! I really thank you for your wonderful product, Kiddie Boost. It really helped my toddler. Thankfully she hasn't had any ear infections or cold since she took it. I really thank you for this wonderful product, Kiddie Boost. It really helped my toddler. B'h, she didnt have any ear infections or colds after she took it.